The lion is called the King of the Jungle and its majestic mane gives it a regal look. Of all the cats, it is the second largest in the world only a bit smaller than a tiger. Lions are found in two regions of the world – African lions are found in Central and Southern areas of Africa and the Asiatic Lion is only found in the Gir Forest National Park in Gujarat, India. These big cats are at top of the food chain and have no natural predator. Although in India the Asiatic Lion population fell drastically due to trophy hunting and now due conservation efforts has been partly revived. Although lions are called the king of the jungle they don’t live in a thick forest and prefer to live in open grasslands. 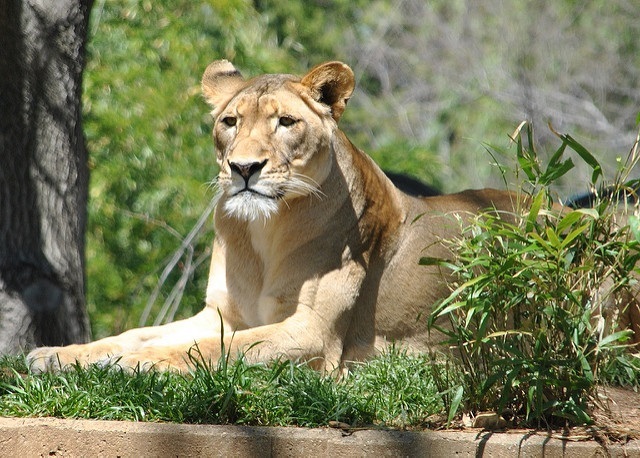 Asiatic lions particularly live in dry deciduous forests and scrubland areas. 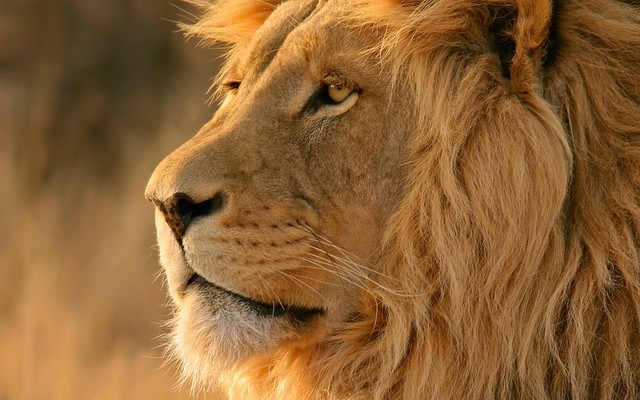 Of the African countries, lions are found in Tanzania, Uganda, Mozambique, South Africa, Sudan, and Botswana. There are 6 sub species of the African Lion. In local languages like Swahili lion is called Simba. The total territory for a single lion pride can extend up to 100 square miles and can stretch over grasslands, woodlands, and scrubs. 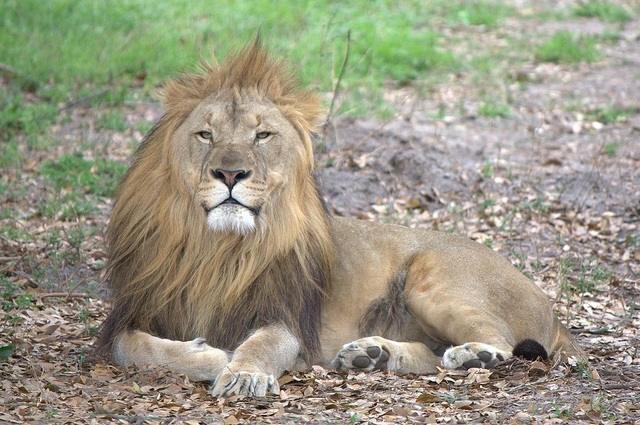 The characteristic mane of the male lion varies in colour and with age, it gets darker. Lions have powerful forelegs with which they can reach speeds of up to 50 mph in short bursts. It can also cover a distance of 36 feet in a single jump. Lion’s heart only make up 0.50% of their body weight, therefore they lack the stamina for a long run. Of the two species of lions, the Asiatic lion is bigger in size. The male lion’s mane starts to grow when they reach to 18 months of age and continue growing till they are 5 years old. The Male and female Asiatic lions weigh in at 120 kg to 226 kg and are 6.5ft to 9ft long, whereas the African lion weigh from 120 kg to 191 kg and are 4.5ft to 6.5ft long. Without their mane and skin, lions are very similar to tigers in shape and bone structure. Unlike other cats, Lions are very good swimmers. Out of all the cats, lions have a distinctive tasseled tail. It is used for signalling and first appears in lions at the age of 5 to 7 months. The lion’s bite is the weakest amongst all the big cats at just about 600 psi, whereas the jaguar has the strongest bite at 2000 psi. The lion’s jaw can be opened up to almost 1 foot in diameter. Lions are very social animals and live in pride from 3 to 40 members at a time. 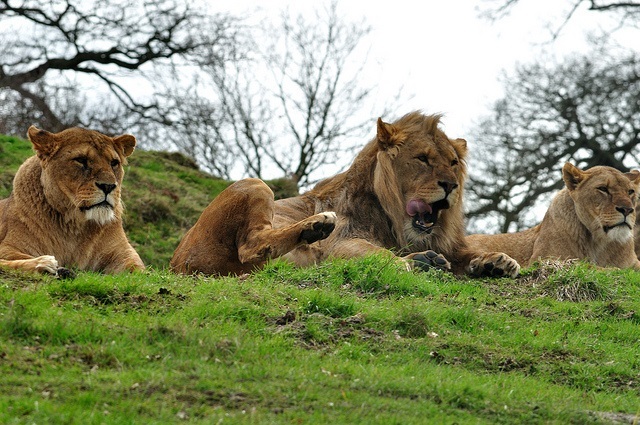 Normally in African lion pride there are about 3 to 4 male lions and around a dozen females. During their lifetime male lions fight with each other over the control of the pride. It is due to this reason that in the wild, male lions have a life expectancy of 10-14 years because of the injuries sustained during fights, whereas in captivity lions can live up to 20 years. 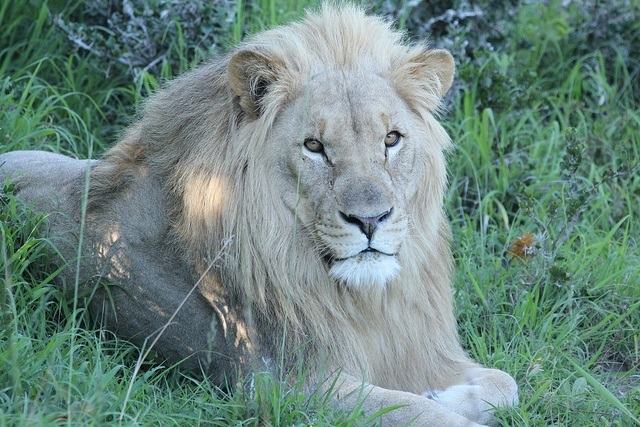 Mostly after fights, if a new leader of the pride takes charge he kills the cubs produced by the previous males. Due to this 60% of lion cubs are killed in their infancy. This also readies the females for mating quickly. There is also a difference with Asiatic lions in the sense that prides consists of either only males or only females and they come together only at the time of mating. 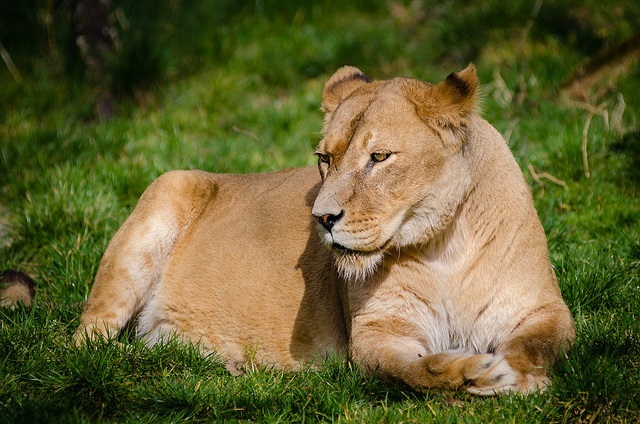 Females tend to prefer lions which have a darker coloured mane. The lionesses are known to care for the new born cubs in a collective manner often sharing their cubs. After mating females give birth to cubs after a gestation period of 3 – 4 months. Female lions continue to stay in the same pride throughout their lives unless there is food shortage or drought. 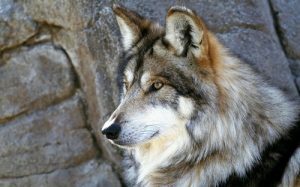 The males however once are big enough are driven out from their pride by the dominant males. Then the young males form a coalition with other males of their age and search for a pride to take over. It is up to the males to defend the pride from attacks from other males. Both males and females mark their territories by urinating and roaring. A lion’s roar can be heard from as much as 5 miles away. It is the loudest roar of any big cat species. Lions also roar to warn their competitors and to bring their pride together if they are scattered. Lions normally hunt during night time and have excellent night time vision. 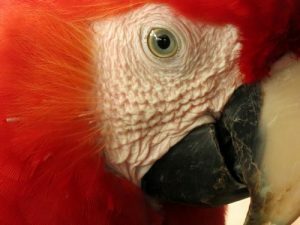 Their night vision is 6 times stronger than humans. During the day lions are mostly resting. They can rest up to 20 hours in a day and only be active for 4 hours. 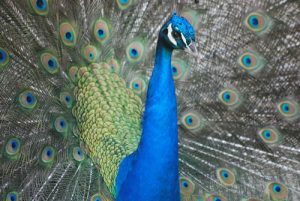 However, if they have an opportunity they also hunt during the day. The prey which lions hunt are very fast from gazelles to wildebeest and while they can sustain their speeds for a longer period of time, lion is not capable of outrunning them. They only run bursts. While lions hunt in groups and attack from a distance of less than 100 feet, individual lions hunt on their own and also scavenge for food. Mostly, lions adopt two ways of hunting. In the first method, lions use muted footsteps to move from one cover to another from where they are within range for a final burst. In the second method, the lion lays an ambush at someplace where their prey is bound to come. It may be a watering hole or a patch of high grass. Here the lion simply waits till a prey approaches. Lions are actually not conscious of wind direction during hunt and hunt upwind as well as downwind. Lions are patient hunters and can spend hours on an ambush for the right moment. It has also been seen that when the prey spots the lions they are comfortable to remain in the same area as they can easily outrun the lion. Lions also can’t move their eyes very well sideways and have to move their full heads to see the sides. Lions have been known to kill elephants and giraffes when they are in a large group. Lions are carnivores and hunting is mostly done by the females. The hunting is done in groups and lions ambush from a close distance from their prey. Their prey consists of large animals like zebras, antelopes, buffalo, wildebeest, giraffes and even elephants. 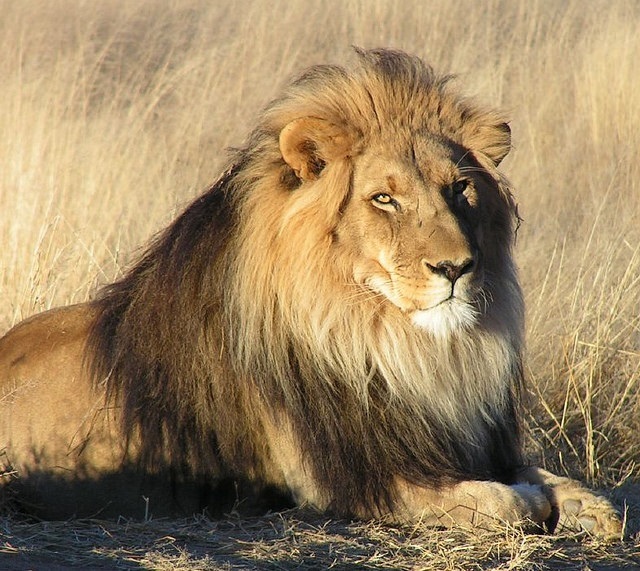 On an average, a single lion can kill 15 large animals in a year. Lions also scavenge food from other predators like hyenas and cheetahs. Although the lioness does most of the hunting, the male lions often take first right to the carcass. On an average, an adult lion will consume 18 pounds of meat in one day. More than 50% of lion’s diet is covered by scavenging. The lion’s tongue is very rough and is able to peel the skin of the prey and finish all the flesh. Buffalos are lion’s favourite prey because they give a huge amount of meat which can feed a large pride owing that they weigh almost a ton in weight, but buffalos are powerful animals and they also cause the largest number of lion deaths every year by any other animal. At the beginning of the 20th century, there was large-scale hunting of lions as trophies. This caused the lion numbers to dwindle worldwide. More so, in India there were only 20 Asiatic lions left due to excessive hunting. Asiatic Lions were hunted by Indian Royalty, British Colonists and also the local population which started to clear the forest area for agriculture. It was in the year 1900 that the Nawab of Junagarh declared the Gir Forest Area as protected area and raised efforts for lion conservation. The numbers have improved since then and as of 2015, there were 523 lions recorded in the National Park. Scientists and conservationists use the lion’s whisker spots to identify them. Although the Gir Forest Reserve is quite well protected and there are only a few instances of poaching, it only provides a limited area of habitat. In the near future as the lion numbers increases there will be a need to relocate some of them in different forest reserve areas. Lions, at one time, were found in parts of Europe, North and South America, Africa and Asia. Due to climate change and hunting, lions are only found in parts of Africa and Asia. At the turn of the century there were about 200,000 lions out in the wild in Africa but due to excessive hunting, their numbers have gone down to 15,000- 30,000 currently. Lions are an endangered species and need proper conservation. Even in this age about 600 lions are killed each year for trophy hunts and 60% of the trophies are sent to the USA. Some places have areas where lions are bred and then used in trophy hunting. Many countries also used the lion as their official national symbols like Singapore, England, Belgium, Albania, Ethiopia, and Netherlands.